Comedy Central's Jon Stewart and Stephen Colbert have announced dueling D.C. rallies on October 30 aimed at satirizing the August 28 "Restoring Honor" rally held by rival network Fox News Channel's Glenn Beck. The liberal media just can't stand all the attention Glenn Beck got for his "Restoring Honor" rally in Washington, D.C., last month. On Thursday, left-leaning comedians Jon Stewart and Stephen Colbert announced dueling marches on our nation's capital to take place three days before Election Day. 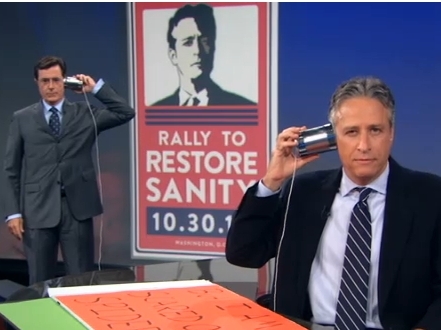 Stewart is calling his the "Rally to Restore Sanity," and Colbert's is the "March to Keep Fear Alive." When Joe Scarborough wondered out loud "how many times can you set your hair on fire?" before viewers stop being shocked, you might have thought he was talking about Keith Olbermann, the man whose scenery-chewing soliloquies inspired an instant-classic Saturday Night Live skit. But no, Joe was speaking of Glenn Beck. Perhaps the shot Scarborough took at Ed Schultz a couple weeks ago exhausted his monthly quota of internecine MSNBC insults. On today's Morning Joe, Mika Brzezinski and Joe took turns ripping Beck's promotion of the rally at the Lincoln Memorial he's staging Saturday on the anniversary of Martin Luther King, Jr.'s "I Have a Dream" speech. Riffing off a Colbert Show segment showing clips of Beck, Mika claimed he sounded like a drama student "on crack." Scarborough, suggesting Mika might have gone too far, surmised Beck might merely have taken "stupid pills." Conservative talk-show host and The Obama Diaries author Laura Ingraham appeared to promote her book Wednesday night on The Colbert Report on Comedy Central. 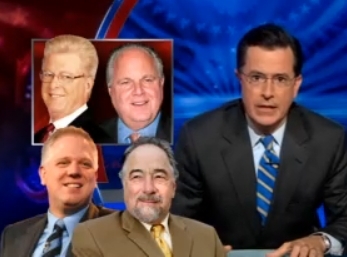 Fake-conservative Stephen Colbert suggested the Republicans didn’t have a visible agenda. But he really went after Ingraham in claiming it was somehow one of “the most hideous, hackneyed racial stereotypes” to joke that Michelle Obama ate baby back ribs. COLBERT: What are the odds that Barack Obama’s private musings would completely and perfectly match up with the narrative the right is trying to push about him? Comedy Central's Stephen Colbert on Wednesday defended Helen Thomas's anti-Semitic remarks by attacking conservative talk radio hosts Rush Limbaugh, Glenn Beck, John Gibson, and Michael Savage. 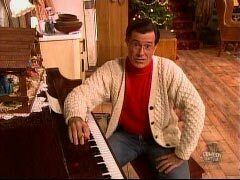 Addressing the comments that led Thomas to resign her position with the Hearst News Service, Colbert said, "Jesus Christ on a matzo cracker, Helen. What were you thinking?" He continued, "You don't just blurt out racially charged comments on camera." Appearing on Monday’s The Colbert Report on Comedy Central to promote his book, "The Promise," MSNBC political analyst Jonathan Alter – also of Newsweek – asserted that President Barack Obama had "prevented another Great Depression," and declared that Obama had it more difficult than Franklin Delano Roosevelt because he had to "sweep up" like a "shovel brigade" after President Bush, as he used a word that had to be bleeped out for airing. Alter: "He proceeded to make history almost right away, not only because he was the first African-American elected President ... we were all living history. This man prevented another Great Depression." He soon added: "At the beginning, FDR only had to deal with domestic problems. Obama was left to run what you could call a shovel brigade, you know, the guys who sweep up after the elephants when the elephants leave their s- (BLEEP) all over the circus, right? ... Roosevelt didn't have to deal with foreign policy when he became President. 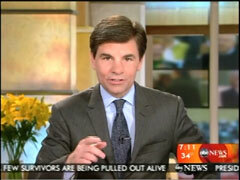 Obama had to deal with a whole nother mess, one of Bush's messes, in Afghanistan." Comedy Central's Stephen Colbert on Tuesday actually moderated a debate about global warming. In fairness, it was less of a debate and more a vehicle for him to make fun of his guests Joe Bastardi of Accuweather and Brenda Ekwurzel of the Union of Concerned Scientists. Is it possible to be so wrapped up in a media culture that one could minimize a sacred religious holiday in a shoddy attempt to write a clever headline? Mediaite's Tommy Christopher and his editors seemed to have pulled this feat off. Christopher, who has had a much-publicized run-in with Andrew Breitbart, has a new hero, former American Enterprise Institute scholar David Frum. Christopher elevated Frum to messianic status in a Good Friday April 2 post headlined "Did David Frum ‘Die' For GOP's Sins?" 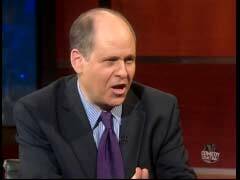 specifically praising the former AEI scholar for his appearance on Comedy Central's April 1 "The Colbert Report." 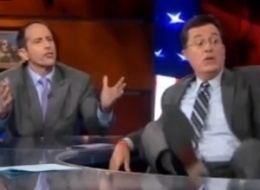 How Are Jon Stewart and Stephen Colbert 'Modern-Day Prophets' for Christians? 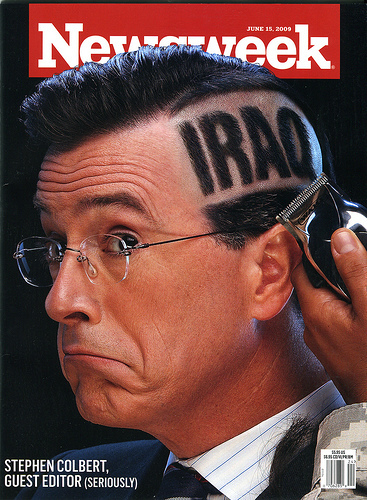 Journalists, cable and radio talk shows, and even Jon Stewart and Stephen Colbert have reported on or spoofed Beck's attempt to discredit this concept. Even the left-wing comedians have spoofed Beck? And yet, I don't recall Wallis the Outraged Christian saying anything about Colbert's Christmas special, which joked that the Christians would like to murder the ACLU in their beds, and that Christians are just like Muslims in believing in a "dark and spiteful God." 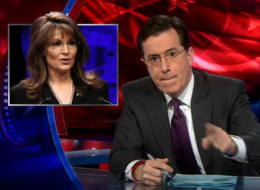 The media's hate parade against the former governor of Alaska hit a disgraceful peak Monday night when comedian Stephen Colbert said on national television, "Sarah Palin is a f**king retard." In a five minute segment bashing the former vice presidential candidate for her remarks at Saturday's National Tea Party convention, as well as her use of crib notes -- surprise! -- the Comedy Central star ended with the controversy surrounding White House chief of staff Rahm Emanuel's "retard" comment. CNN analyst Paul Begala sure likes creating what liberals call a "climate of violence." A week after insisting Barack Obama should deck Scott Brown on the basketball court – "throw him an elbow under the hoop" – he appeared on Comedy Central’s Colbert Report and joked about how Obama’s "going to clock John Boehner right in the face." In addition to that Republican-punching vision, Begala strangely insisted that Taco Bell workers speak Spanish in talking about bipartisanship: "I say gracias to the guy at Taco Bell. That doesn't make me bilingual." Even more strangely, Begala insisted Obama hasn’t been blaming the Republicans for the faltering economy: "The Republican economic philosophy ruined this country and this poor president inherited it and is trying to fix it."